The SABER line of heavy-duty, precision paper cutters combines proven mechanical design – manufactured to ISO-9001 standards, with state-of-the-art electronics. Incorporating the knowledge gained in over 20,000 microcut installations worldwide, the system offers a wide array of programming options and features, presented in an intuitive, easy to use format. The Saber X15 comes in 95 cm (37″), 116 cm (45″), 137 cm (54″) and 158 cm (62″) sizes. For larger-sized cutting, the large format Saber XXL series comes in sizes all the way up to 320 cm (126″). The knife bar is drawn through the pile, pulled from both ends, insuring stable, precise cutting with even the most difficult stock. A ball bearing leadscrew and linear guide are integral to back gauge control. Together with SABER’s patented DC drive system, smooth and accurate positioning is assured at all speeds. The multi-lingual, active matrix touch screen guides the operator through all operations. Real time data collection, network ready interface, and a USB connection for on-site data input and retrieval are all standard. Chromed main side tables, a one piece base which integrates table supports, and computer controlled lubrication are but a few of the features that add up to 11,000 pounds of precision machinery and years of trouble free operation. SABER is designed to comply with the new CE safety standards, acknowledged as the most stringent in the world. Some 150 machine functions are monitored over 1000 times a second, with duplicity in all circuits. 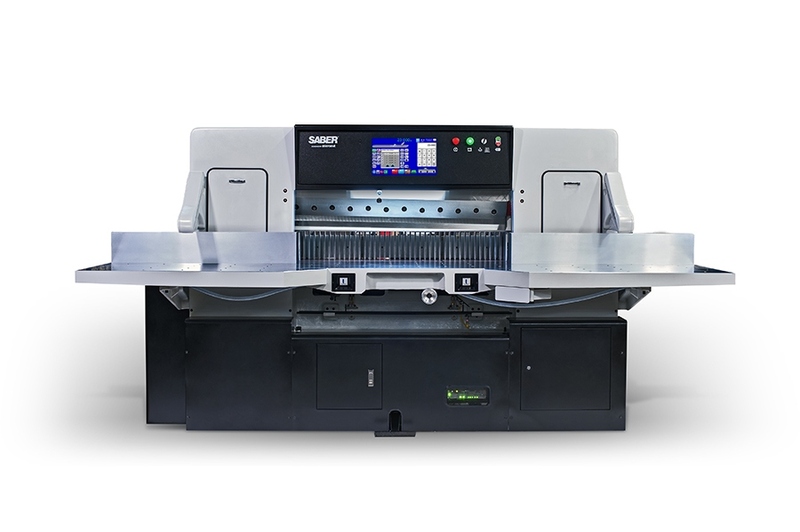 The 141″ Saber X-15 Plus paper cutter has been specifically designed for the large format print market. Its size allows operators to turn up to 5 ft X 10 ft pieces of material within the throat of the cutter. Uniquely designed with the ability to make parallel or eccentric shear cuts, the Saber X-15 Plus can cut most substrates being printed on today. Outfitted with our 15″ microcut WS computer control system, programming is simple and networking is included. And the machine is backed up by the C&P warranty including two (2) full years on parts. Call our sales department for more information. Let us know if you would like a quotation.